This is possibly the easiest chocolate dessert you'll ever make. That doesn't mean that it's the best dessert or the chocolatiest, because it's not. But it does win the crown of easiest, and when your dinner preparation takes twice as long as you thought it would and you realize that baking dessert was the simplest part of your night and you get to impress such charming guests as these with your baking skills, then ease is what you're going for. The recipe comes from The King Arthur Flour Whole Grain Baking book, where those selfless elves at King Arthur Flour aim to make whole-wheat baking a lot more accessible (and tasty) than it's been in the past. It's an admirable attempt, for sure, but I think what I'm realizing is that I like whole grains in my breakfast foods, but not necessarily in my after-dinner desserts. You're supposed to want to be wholesome in the morning, after rising and shining. But after dinner, at night, richness and flavor and mouthfeel take precedence over good nutrition. No? The pudding cake is one of those miracles of science wherein liquid and solid batters essentially swap places in the oven, creating a cakey top and a pudding-y bottom when you spoon out the cake. We served ours with heavy cream, for pouring, and creme fraiche, for dolloping, and because I tried this cake both ways (I can be such a glutton), I can tell you that the tang of the creme fraiche coaxes out all kind of chocolate-y flavors from the cake and elevates this ho-hum dessert into something a little more special (the heavy cream just sort of moistens it all without adding any real character). But you can't really escape the fact that you're eating a whole-wheat dessert - the flour is too assertive. 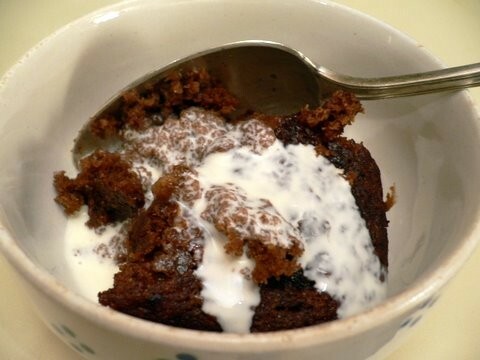 After our bison steak dinner the other night, the pudding cake was a nice enough end, but the leftovers sat untouched in the fridge for three days before I took pity on them and threw them out. I think that's the real judgement here. 1. Heat oven to 350 degrees. In a large bowl, whisk together flour, granulated sugar, ½ cup cocoa, baking powder and salt. In another bowl, beat egg into milk and add vanilla, espresso powder and melted butter. Add to dry ingredients. Mix to blend. Spread in a 9-inch square baking pan or a glass or ceramic baking dish. 2. Whisk remaining cocoa with brown sugar and spread over batter. Slowly pour hot coffee or water on top. Do not mix. 3. Place pan in oven and bake 35 to 40 minutes, until batter appears set and sauce is bubbling. Remove to a rack and let rest 15 minutes. To serve, scoop portions into goblets or onto plates and top each with ice cream.